For some added modern style in your bathroom, choose this beautiful vanity. Its beautiful white artificial stone counter and grey fiberboard base bring a great new look into your bathroom. Its double-door cabinet and drawers have lots of room to keep all of your bathroom items. Bring a classic look and feel to your bathroom with this beautiful set from Wyndham Collection. 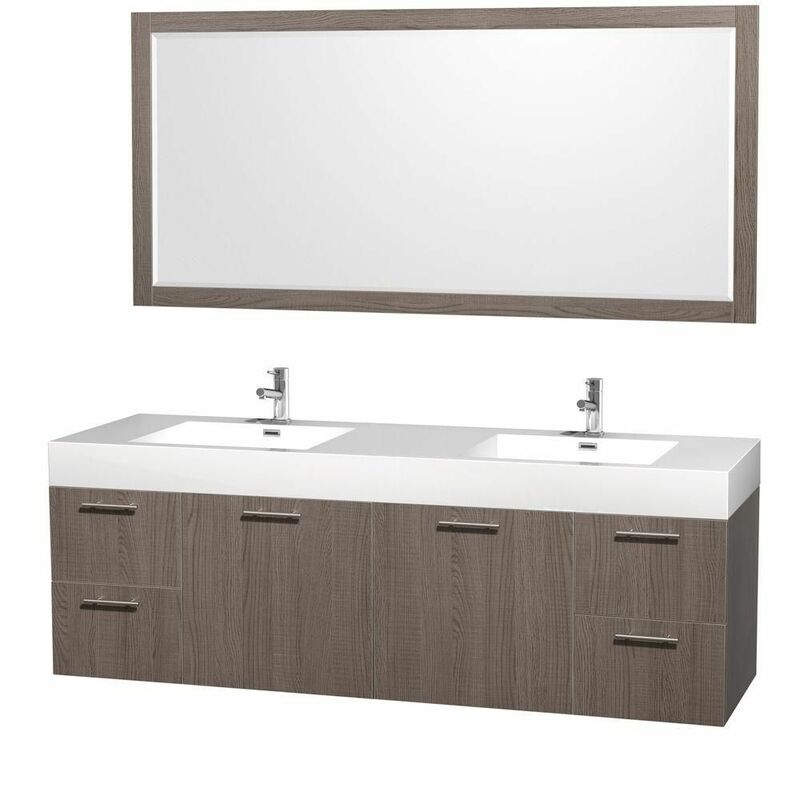 Amare 72-inch Double Vanity in Grey Oak with Acrylic-Resin Vanity Top in White and Integrated Sink This Amare wall-mounted bathroom vanity delivers beautiful wood grain exteriors offset by modern brushed chrome door pulls. It features plentiful storage areas tucked behind sturdy soft-close doors and drawers. It was constructed of environmentally friendly, zero-emissions solid oak hardwood, engineered to prevent warping and last a lifetime. Amare 72-inch Double Vanity in Grey Oak with Acrylic-Resin Vanity Top in White and Integrated Sink is rated 2.2 out of 5 by 5. Rated 2 out of 5 by Erin from I liked the sinks very much but the cabinet itself... I liked the sinks very much but the cabinet itself was cheap looking and this was not a cheap item. I returned the product and kept looking elsewhere. Rated 1 out of 5 by Anonymous from Beware! Great design BUT...the acrylic resin sink is a nightmare! Arrived damaged. The seller sent a replacement, also defective and returned, but would not credit us for the top. We've ended up choosing a granite top from a local dealer for the base which is MDF, not wood. Rated 3 out of 5 by momus from Good looking, water stays n the sink I guess there is a reason why the sinks are round: it is for the water to run out freely. We have always a puddles and drops remaining in the sink. Good looking vanity though. Sink hole TOO close to the side of the vanity. Pop-up faucet will not extend fully due to the wall! Rated 4 out of 5 by KellyL from Didn't realize it was a floating vanity I love our new vanity, sinks and mirror! We just didn't realize the vanity was floating and needed to be mounted to the wall. The brackets to hang it on the wall do not match up to the studs in the wall. So instead of adding studs to mount it, we built a base for it and set it on that. It still looks beautiful even though it's not floating.